When using Moodle Mail, users can view previously sent mail. 2. 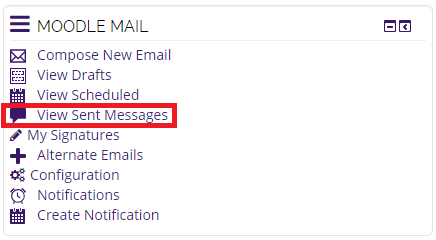 Navigate to your Moodle Mail block, and select View Sent Messages. Note: if you do not see the Moodle Mail block, you may need to Turn This Block On. 3. You will be redirected to your sent messages. Here you can see which messages have been sent as well as a short preview. You can sort these messages by course, subject, or time sent. You can also view the full body of previously sent messages. You will need to do these steps if you do not see the Moodle Mail block on your Moodle page. 2. Select Moodle Mail in the Add a Block drop-down menu.